Colour-switching sticklebacks, geckos with enough adhesive power to hold up a human, bats with built-in sonar and moles with amazing noses - this week we go in search of the world's most incredible animals. Scientists passionate about their species put their cases to our panel. But which animal will be crowned king? This week we're asking what's the most amazing animal? Talking to Ginny Smith, Nick Crumpton from the Natural History Museum, did his PhD on moles. Nick - For starters, how about their strength? Now, these animals are pretty incredible. They are super strong. If you have a look at their arms, you open up their arms and have a look at how big the muscles are, they're absolutely ginormous. Now, their humorous bone which is the top of your arm, that's actually as wide as it is long. And that's all for muscle attachments. So, these guys are really, really strong indeed. 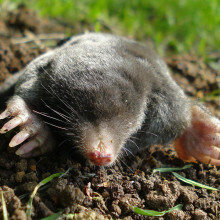 Now, we know that some species of moles can exert a force that's 24 times their body weight. Now, that's like a 12-stone person. It's a little bit more than me, like moving a 1.8-ton block. Now in addition to that, think about where they live. These guys live under the ground. They live in tunnels. So, that not only means that you have to move all that soil out of the way. That also means that you've got to make a living where you can't see but also, where breathing is actually really, really difficult. We know that the concentration of carbon dioxide in tunnels is 10 times greater than it is at the surface. We also know that the amount of oxygen found down there is less than half what we're used to breathing. Now to deal with that, that means that moles actually have twice as much haemoglobin in their blood. So, haemoglobin is the stuff that makes your blood red and it's the stuff that actually soaks up oxygen into your body. Ginny - Moles are well-known for being blind. Being blind doesn't sound that amazing to me. What's so good about them? Nick - Oh Ginny, that's because you've got such amazing eyes. You are using them all the time and there are lots of other ways that you can find your way around without using the eyes. There are an awful lot of blind animals. But moles use their tactile sense. Ginny - How good is their sense of touch compared to say, yours or mine? Nick - The front of their face is more sensitive than our fingertips. Ginny - So, we've got a little demo to do to show you just how sensitive your fingers are and what it might be like to be a mole. What's your name? Ginny - And how old are you? Nick - So, I've got some stuff in this sack right here. We've got some objects and you're not allowed to look at them. So, I want you to maybe - look at the audience, they look like a friendly audience. That's good. Ginny - Close your eyes as well just to be sure. Nick - I want Gavin to use his sense of touch and try and work out what this object might be. Now first of all, we're going to use a part of your body that maybe you don't use an awful lot for touch and that's going to be your elbow. Gavin, show me your elbow. Yes! And then after that, we're going to see how good you are at working out what this object might be, using your fingertip. Now, I'm going to push this against your elbow and see if you can tell me what this might be. Ginny - Gavin, if you want to move your elbow around, you can do that and sort of try and feel what it might be. What can you feel? Gavin - It feels smooth. It's very tiny, some spikes. Ginny - Some spikes. Okay, any ideas what kind of shape it might be? Gavin - It might be like a circular cone shape? Ginny - He's not doing too badly. Shall we see how well you do with your hand? Nick - So, don't open your eyes and I'm going to put this in your hand. So, here you go sir. Ginny - Okay, now see how quickly you can tell me what that is, feeling with your hands. Gavin - It's like a type of car toy? Ginny - It's a car toy. A round of applause! So, once you were feeling with your fingertips, was that fairy easy? Ginny - Do you think you ever would've got it with your elbow? Gavin - No, because my elbow is quite bigger than my hand. Ginny - No matter how many times you'd put that on his elbow, I don't think he ever would've got it. And yet, our fingertips work really, really well. So, why is that? Nick - That's because of the amount of touch-sensitive receptors we have on our fingertips. Now, in terms of moles, they have very, very sensitive faces. On the front of their face, they have some really, really special touch-sensitive organs which are called Eimer's organs. No other creature has Eimer's organs. We know that there's lots and lots of them. If you use a really, really high powered microscope and you look at the skin on the front of their nose, you'll see them, and they're little bumps, they're little mounds. We know that every single one of them is super, super sensitive and can tell the brain what's going on in that area. Now, in fact we know that the brain maps that whole front of the nose area. So, a tiny little shape, even if it's just brushing across the front of the face, they know what kind of shape it is. They know if it's edible. Now, this has taken into an extreme, in an amazing kind of mole called star-nosed mole. It has 22 fleshy appendages coming off either side of its nostril. Ginny - Fantastic! Well, I have certainly learned an awful lot about moles. What about you guys? Over to our judges now. Georgia - Thank you, Nick. I have a question. I completely agree with you. Moles are fantastic, but if they had to develop all these traits to deal with underground - the low oxygen, having to dig - why go in the first place? Nick - Well probably, because it's really safe because if you go under the ground, there are not very many predators. Big predators are going to follow you down there. And also, there's loads of food. If you go down before anybody else then you're going to have access to all those worms and all those beetles, and all those other things that are down there. So, it's a pretty smart move evolutionarily. Ginny - Let's get our scores from the judges now. Ginny - Early 10. I think it's about time we saw how the leader board is shaping up. So Heather, how's our leader board looking? Why can some birds use tools? Corina - So, I'm going to ask you Will, if you're going to be able to help me solve this puzzle. Ginny - Okay, so you're just removing a drape that's been covering up a rather strange collection of objects you've got here on the table. So, we've got in the middle a tall glass tube which is maybe 8 centimetres in diameter and it's about half-full with water. It's about 25 centimetres tall and floating on the top of the water is a little red ball. And then around it, we've got a selection of objects. What kind of objects can you see? Will - There's some foam, stones, corks, sticks, and leaves. Ginny - All sorts of weird things. So, what have we got to do here? Corina - If you can get the ball out of the tube then I will give you a chocolate bar or a piece of fruit leather. But you can't tip over the tube. Ginny - So, all you can use is those two fingers, your front finger and your thumb has a little sort of pincer action, and you have to say if you can get that ball out, what are going to do? Will - I think I'm going to put stones in the bottom so the water rises up. Ginny - Do you want to see if it works? Every time you're putting a stone in there, it's displacing some water and the water level is rising. So, what are you aiming for? Will - That the water level rises enough so you can take the ball out. Ginny - Well, done. You managed it. A round of applause. How do you actually go about doing this with a bird? I mean, you can't tell it to get a ball and swap it for chocolate, can you? Corina - No, exactly. So, I actually have to train the birds to drop the stones down the tubes and I do this on a different apparatus. So, there isn't water involved. It's just a tube that's on top of a platform. So, you drop the stone down the tube and it collapses the platform and the food was sitting on top of the platform. So then it falls out when the stone goes through the apparatus. Ginny - So, how long does it take them to learn it? Corina - It depends. New Caledonian crows can learn it pretty quickly and in maybe around a hundred trials. Great tailed grackles, which is the species I'm promoting today, the fastest one was 165 trials and the slowest was like 392 trials... It took her a while. Ginny - So, that's a little bit longer than it took our volunteer here who just took one look at it and did the right thing. Corina - Yeah. So with humans, you can just say, get the reward and they don't need training in how to drop things down tubes because we have a lot of these kinds of experiences, but the birds don't. Ginny - Why are you doing this with birds? I mean, it sounds like a lot of fun but I'm guessing there's a scientific reason. Corina - Why I'm doing this particularly with the great-tailed grackle and for those who don't know, is because they're not a bird that lives over on this side of the Atlantic ocean. They're a bird and they're about the size of a jack saw but they have a really long tail, kind of like a magpie. With this particular bird, they actually have an average size brain for their body size while the crows and parrots have these really big brains and so, one of the ideas about brain size is that if you have a larger brain, you should be smarter. 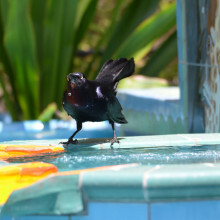 But these grackles, I first found them in Costa Rica. I was studying other animals there and I saw these grackles and they come right up to me and they look me in the eye. I think they wanted my food but I also thought, gosh! They look really smart. What I'm finding which is pretty amazing is that even though their brain is, it weighs as much as a 1p coin, they can solve these problems like children that are 5 years of age and older whereas children that are 4 years old, they don't solve these tasks. And they solve them like the large-brained new Caledonian crows and rooks, and Eurasian jays. Ginny - Yes, so we've known for a while that these other birds that you mentioned, rooks and jays and crows are really, really intelligent. But we've always thought that they have very big brains compared to their body size and that that was why. But this is really throwing all that into the air. These animals have 1p coin. That is tiny. How come they can do this? Corina - So, the neurons are how the brain is cognitively processing things. So, if you have more neurons, you should be able to do more things cognitively. And so, they have been finding that the number of neurons in your brain does not scale with how big your brain is. So, you can have a very large brain but not very many neurons. I think it's going to come down to looking at how many neurons different species have so that we can make better predictions about how smart an animal should be. Ginny - Do we know anything about how many neurons your grackles have yet? Corina - We do not. I'm waiting for some papers to come out this year. I've been waiting and waiting, and I'm really excited to see the results, but we don't know yet. Ginny - So, it may be that packed into that 1p coin, they've got loads and loads - these cells which are actually doing the work, talking to each other and that's what allows them to be so intelligent. Ginny - Thanks so much. That was Corina Logan everyone. Before we get to the judges, it looks like we have a question from the audience. What is it you want to ask? Young Boy - Didn't they do some sort of study about birds using like a wire or a piece of metal to hook their food out of a tube like that? Corina - Yes, good memory. So, this was work that was at Oxford with the New Caledonian crows. They not only used tools, but they make a lot of different kinds of tools. One of the kinds of tools they make is this hook tool out of sticks. Now, there's another species that's here, the rooks, and they are also able to do this. So in the wild, rooks don't use tools. They don't make the tools, but you bring them into an aviary and you give them a straight piece of wire, they'll make a hook and they'll pull the basket out. Ginny - Amazing! Over to the judges now. Has anyone got a comment or question for Corina? Max - You mentioned a few other tasks that crows could do and if you're saying that these birds are really smart despite having tiny brains, have you found any other tricks that they can do? Corina - So, the grackles are different. They're not tool users and I did check for some tool use in the lab and I did not see that. They tend to flip objects over and look under rocks and things for food as well as digging in our garbage and eating at our outdoor cafés. They love chips and so, as soon as you turn your head, they're on the table, stealing your chips, so they can fly away and eat them. So grackles have slightly different strategies than the crows have. Ginny - So, watch your chips if you're near a grackle. Okay, let's go over to our judges for your scores now. Let's start with George. Georgia - I'm going to go with 6. Max - I kind of think you made crows sound more cool than grackles so I'm going to 6. Ginny - Okay, a round of applause for Corina Logan. Now, let's go over to Heather to see what that's done to our leader's board. Heather, how is it looking now? Heather - So, our grackles seem to be flying south with 19. The sticklebacks are swimming downstream with 21.5. 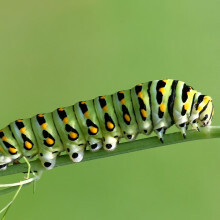 Caterpillars are crawling just behind our leaders, moles which are clawing onto victory with 26. Geckos can hold up two humans! Ewen - Geckos are nature's best exponents of stickiness. An awful lot insects especially show how you can stick to things, flies, walking around on ceilings and up glass panels, and also, various plants also use stickiness to catch their prey like sundew in the bogs. But geckos do it in a completely different way. Their stickiness is what's called dry adhesion. So, they leave no mark after they've gone. So, they're not using any sticky compound like the glue you would have used in the classroom. Now, geckos are also pretty cool because they're really cute and they run around. They don't have any eyelids so they tend to just lick their eyes when they need them cleaned which is quite fun to look at. But what really sets them apart is the fact that they can literally walk up walls. They are nature's Spidermen if we're going to use the superman analogy that's already been used. Probably a lot better than Spiderman actually. Geckos have been around for a very long time, over 100 million years. We actually know that they could walk up things 100 million years ago because they've actually found some fossilised in amber and they can actually see they're on their feet. They still have the same structures, the same type of skin that allows them to do this. Basically, until about 2002, nobody really fully understood how this happened. 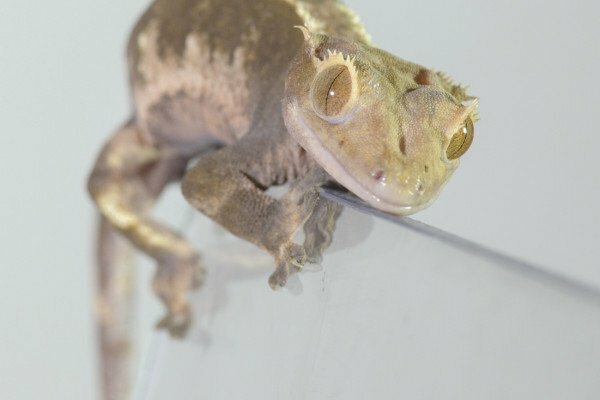 So, what we're now talking about are geckos harnessing the laws of physics. So, they actually got a really good scientific head on to actually capture and use the forces of nature at the smallest level, what we call the nanolevel. If you take a millimetre divide it by a thousand, you get a micron. You divide that by a thousand again, you get a nanometre. So, we're working at a very, very, very fine level. What they found when they looked at the gecko feet under the microscope - it was the electron microscope - they found that on their feet were tiny hairs. These hairs which are called setae, whilst these are little hair-like structures on the ends of these little hair-like structures, there were even smaller hairs. These smaller hairs are called spatulae and basically, if we try and get some idea of scale, if you take a setae, you can get 14,000 of them on one square millimetre. On top of each of these setae, you can get about 500 spatulae on top of that. So, you can imagine, it's basically a column with tiny little hairs on which you get even finer hairs on. These tiny little hairs use a force called van der Waals forces which are all around us. And in fact, we use them and we experience them in terms of friction amongst other things when you want to hang on to something. But what this allows a gecko to do is, it allows these tiny hairs to get very close to the surface of glass or the ceiling or a tree or a leaf. And the natural forces, these natural harnessing of physics actually enables them to stick. 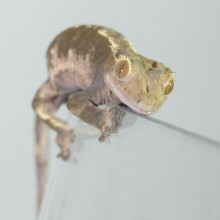 Now, they don't actually need to stick very significantly because most geckos are quite light. They're about 20 grams actually, a lot of them. But if you could harness every single one of these spatulae, one gecko, with all his fingers and all his toes could actually take a weight of 133 kilograms that's two human beings. Ginny - So, could you hang off a gecko? Ewen - If the gecko was properly attached, yes. But I don't think they'd thank you for it! Ginny - Now, you've been talking about how the geckos can produce these amazing forces. But we've got a demo here that's going to show everyone how powerful friction can be. So, what have we got here? Ewen - What we've got here are two books which you imagine, they open ends facing one another where each page is interleaved with the other to actually then give a really large surface area of the paper in contact with the other book to enable the maximum amount of friction to occur. Ginny - So, the two books that goes page from book one, page from book two, page from book one, page from book two, all the way through. So, they're touching over 200-odd pages. Who thinks they're quite strong? Okay, what's your name? Ginny - Gavin and Davin, okay fantastic! Now, what we're going to do is we're going to have a little tug of war between you two. So, if you stand facing each other and one of you is going to hold on to the spine of this book and the other one is going to hold on to the spine of the other book. When I say go, I want you to pull. Okay, ready, one, two, three, go! You don't look like you've made any difference to that book. Were you pulling as hard as you could? Davin - I think it might be just glued. Ginny - You think it might be glued. He doesn't believe me. Okay, now Georgia is having a go. It's really, really difficult and that is the same idea as the gecko's. Ewen - In principle, yes. It's about getting literally the atoms of the surface close together between one surface in the next that allows this special attraction called Van De Waal's forces to actually work. It's all pervasive with the gecko that all the gecko needs to do is, it just sort of stops and he can hang on for hours. Ginny - So, he's not using his muscles to hold on to the wall. Ewen - Not at all. But one question that no one's asked is how then do they unstick which I suppose I better explain because basically, I called these tiny, tiny hairs spatulae. So, it's like a spatula in cooking, a bit like a wooden spoon with a big flat end. And that's the structure of these tiny little features is they've got this little angled foot. And basically, what it means is when the gecko actually climbs, it cools down a little bit and then it sticks. When it wants to move on, it lifts and peels them off. It can peel it off with virtually no force. Ginny - So, I just saw Georgia just checking that I hadn't glued it and unpeeling each layer of the book and it does. It just unpeels very, very easily and you can see that it's not glued. That's the same thing that the gecko is doing again. Ginny - Ewen Keller, thank you very much. Time to hear from our judges now. Who's got a comment or a question for Ewen? Georgia - Firstly, do the geckos have to be alive for it to work? Ewen - The phenomena works with the geckos being well and truly dead, as well as being alive though they can't obviously move their feet themselves. Georgia - I'm wondering. Can I strap some geckos together and make gecko gloves and climb up buildings? Ewen - Well again, this is virtually a reality now. They're already are starting to show synthetic versions of this where a man has been demonstrated to climbing up a glass wall. It was only a year or so ago. So, the world of Spiderman is going to become a reality. Max - It's incredible that geckos can do this, but I've done some work in the tropics. I've definitely seen a gecko fall off the ceiling. So, if they're so strong, how can they fall off? Ewen - Well I guess, like anything, there's always clumsy geckos out there. If it's a very, very wet surface then the adhesion will drop off. So, it could be that it was just a very, very wet area. Gavin - Does it share this sticky thing ability with the tree frog? 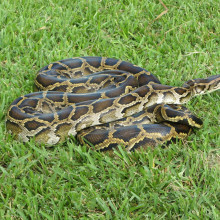 Ewen - It's true to say that there are other some other reptiles and maybe some amphibians who have a similar property. It's predominantly the geckos, but it isn't unique to geckos. There are some other lizards that would do it. Ginny - If our judges are ready, can we have your scores please. Georgia - Big fan of the geckos, I'm going to go with an 8. Ginny - One final round of applause for Ewen Keller. How do slithering snakes swallow prey so much bigger than their own heads? Bats use echolocation - ultrasound sonar - to find their way around and to hunt down prey. But how do they do it? Lauren - Well, some of my competitors this evening have already mentioned how their amazing animals should kind of have similar powers or interesting features that super heroes have. But my amazing animal actually has a super hero named after it which makes it especially cool - batman. And they are found across the world in every single type of habitat or part of the world except for the Polar Regions, where it's too cold and there aren't any insects that they can eat. Now I'm particularly fond of the British bats here in the UK and we have 18 species of bat here in the UK and 7 within Cambridge City. There are two major groups, two major types of bats. We've got the mega bats which are humongous bats with dog-like faces, big eyes and little ears. Most of them are eating fruits. Some of them like to eat nectar from plants and then we have the micro bats which are usually the smaller bats. They have big ears, little eyes, and are often insect eaters. And all the bats here in the UK are the micro bats. They're all insect eaters. Now, the size of bats varies hugely. The biggest bat in the world is a flying fox and it has a wingspan of 2 meters. So put your arms out, stick your arms out side to side. The flying fox is bigger than your arm span. It's humongous and it can fly straight out into oceans for long, long distances. The smallest bat in the world was relatively recently discovered and it's called the bumblebee bat and it is as small as your thumbnail. Here in the UK, of our 18 species, our smallest bat, the pipistrelle bats, we've got a common pipistrelle and a soprano pipistrelle. 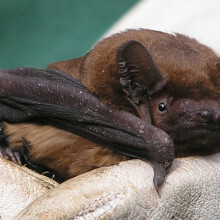 They're about 23 centimetres wide and the biggest bat in the UK is the noctule bat which has a 40-centimetre wingspan. So, it's quite substantial and you see them flying high across hedgerows and treelines here in the UK. Bats do some incredible things. Some of the most amazing things includes hibernation and echolocation. So, hibernation is particularly important for bats that live in temperate environments, like ours here in the UK, where you have seasons, you have a hot summer; you have cooler autumn; really cold winter; and then a lighter spring. And because during that winter period, there aren't any insects available for them to eat, they need to go to sleep. And they need to get their body temperature really, really, really low so that they're not using energy because there's no food to replace that energy. So, they slow their heart rate down to 4 beats per minute. And this means that they can get their metabolism down and make sure their body temperature is the same as the air temperature and that means then they're not losing energy by heat into the atmosphere, and can save as much fat through the winter to try to get them back through until the spring comes. Certainly here in the UK, they'll start to go into hibernation about October time and they'll hibernate all the way through until about March time. So, our bats have started to fly around again and started to feed again. Now, you might just have heard that crackling then popping sound. Now, that is the sound of a bat. What we've done with that recording is we've taken a bat detector out into the field and the bat detectors recorded the noise that the bat is making. But then the bat detector does a special calculation to turn that noise into something we can hear because bats, their echolocation calls and many of their social calls are really high pitched, at a frequency our human ears can't hear. And so, that noise is the right pattern that is actually going on outside all of the time, but something scaled down to what we can hear. What the bats are doing is they're giving humongous shouts out to their environment and the shouts are so loud that they can deafen themselves. So, they actually have to detach their ears so that they don't deafen themselves when they shout. And then that noise bounces off the environment and depending on how far away an object is from them, that depends on how quickly the sound comes back and then their brains make a calculation about the distance to the nearest tree, the distance to the nearest wall. But the sound and the complexity of those soundwaves is so fine that they're able to determine shapes and features as well which means that a pipistrelle bat, our 23-centimetre long bat is able to find tiny little gnats and mosquitoes in a whole field of trees and leaves and other insects and moths flying around. Ginny - Those are some amazing abilities - to be able to fly, to be able to see in the dark with sound. I think bats have a good chance of giving the other animals we've talked about tonight a run for their money. But let's go over to the judges to see what they think. Georgia - Thanks, Jade. You mentioned batman. I love this idea of an actual batman like, think how much better Ben Affleck would be if he was fluffy, squeaked loads and could detach his own ears. I would watch that film. Max - I just wanted to ask you a little bit more about detaching their own ears. Just how? Jade - You know like within our ears, we have three little bones. Well, they've got the ability to separate those for a fraction of a second while that shout goes out. Ginny - In our human ears, to conduct the sound from outside to inside, as Jade says, there are three bones which connect to each other. The air pushes our eardrum, that pushes one bone, and pushes the next bone, pushes the next bone, and that's transmitted off into our brains. So, if you separate two of those bones, that information can't get from the outside through to the brain. So, I think that's right. That's how that works. 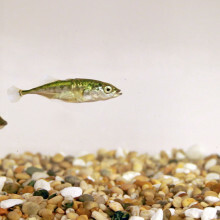 We finally find out what has happened to Jolle's stickleback fish! Ginny - Now, it's very nearly time for our final scores but before we do that, we need to go back to Jolle and see how your fish have done. So, if you remember, right at the beginning, we had some sort of goldish-brown coloured fish and we put half of them in a black tank and we put half of them in a white tank. What are they looking like now? Jolle - They're very hard to find now, so it takes me a while maybe. Ginny - What can you see? George - One fish is black and the other one is white. Ginny - So, they do look really different now, don't they? Jolle - You can see that in this just one hour, these fish looked totally different from one another. And this is really great because this helps them to be camouflaged against their background. It helps them that all these predators that are out there will not find them as easily. Ginny - So, if you look at them from the side, you can see almost stripes of black on the one that's been in the black tank whereas the white one is just very pale. Most of the colour seems to be focused on the top half of the fish. Their undersides, their tummies, are still kind of silvery. Why is that? Jolle - Most predators are actually aerial. Imagine herons standing next to a creek. So, these birds, they look down. They try to find these fish. But if you look at them from above, this is when you see their back and this is the most camouflaged part. Ginny - Do you want to show the judges and see if they'll give you an extra point? Ginny - What about you Max? Georgia - This is a tough judge. I'm impressed. Max - The experiment works. He'll definitely get his bonus point. Ginny - One more bonus point for Jolle and then you the audience are going to make the final decision as to who the winner is out of our top 3. So Heather, can we have the final tally? Who are our top 3 animals? Heather - So, our extra stickleback point didn't actually change, they didn't make the top 3. We have the moles dug in for victory with 26, but the bats swooped in for a tie-breaker and also have 26, with the caterpillars just crawling slightly behind - 25.5. Next Why don't babies laugh when they are born?